Natural lacquer (urushi) is one of humankind’s oldest materials. 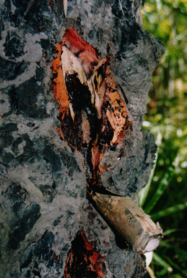 In the Stone Age, over 9,000 years ago, people discovered the adhesive and protective properties of the sap of the lacquer tree, and used it in the making of spears and arrows, and to strengthen and protect utensils and other objects. It is still used today by people in East Asia to protect and decorate plates, bowls and ornaments. In the past, in China, Korea, Tibet, Myanmar, Thailand, Vietnam, Cambodia and Laos natural lacquer was used extensively in the decorating temples, creating temple art, and making Buddhist images. Today, in many parts of East Asia, natural lacquer is still used in the production of tableware and utensils for everyday use as well as in creating urushi artwork. It is also used in the restoration of lacquerware and temple interiors. Urushi is the purified sap of the lacquer tree. The scientific name of the tree used in Japan is Rhus vernicifera (Toxicodendron vernicifluum). It is native to China, Korea, Japan, and the eastern Himalayas region. The sap of this tree contains a resin—urushiol, which when exposed to moisture and air, polymerizes and becomes a very hard, durable, plastic-like substance—lacquer! Urushi is, in fact, a natural plastic. A similar tree, Gluta usitata (Melanorrhoea usitata), with similar properties, is found in South-East Asia. 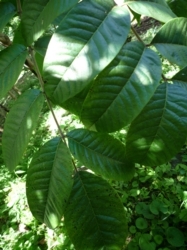 In northern Vietnam there is another, similar tree. Sap from all these trees has similar properties and is used in the same way as Japanese urushi sap. 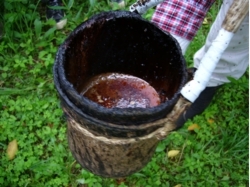 In Japan, there are urushi plantations in Iwate, Ibaraki, Niigata, Fukushima, Tochigi, Kyoto, Okayama, and Hiroshima where the sap is still collected. 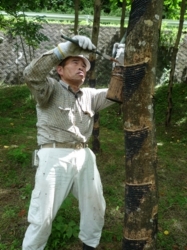 Once planted urushi can be collected for about 10 to 15 years. Urushi is collected from May to October. The raw urushi is then filtered to remove impurities. It is then further refined. First by removing moisture (kurome) and then by stirring the liquid to create a fine emulsion. The active component is “urushiol”, which when exposed to moisture and air, polymerizes and hardens (it does not actually "dry"). Constant temperature and humidity is required for it to harden uniformly, so urushi work is often "dried" in special dust free chambers. Once hardened, urushi is resistant to alkali, acid, and heat. By adding various natural pigments, urushi can be colored―black, red, brown, or yellow. Gold powder is used decorate the lacquered objects. In addition there are various types of decoration including “maki-e”, “raden”, “chinkin”, “hyomon”, “kinma”, “urushi-e”, “haku-e”, and “rankaku”. Especially in Japan, the decorative power of urushi became an important aspect of its artistic culture. In Myanmar lacquer is called “thit-si”. 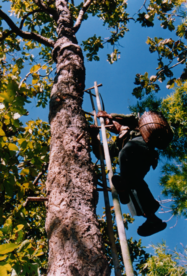 Lacquer trees are found in Northwest and west Myanmar. The scientific name is Gluta usitata (Melanorrhoea usitata). 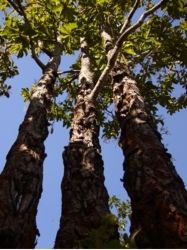 It is in the same Anacardiaceae family as the Japanese-Chinese and Vietnamese trees, but this species is much taller with large leaves and thick bark. The active chemical is “thitsiol". Myanmar lacquer hardens much more slowly than Japanese-Chinese or Vietnamese lacquer. The sap is black and after dry - shiny. In Myanmar, people call lacquerware “yun”. Lacquer is used in daily life to strengthen baskets, bowls, cups, plates, furnitures, and other utensils. It is applied by hand or using simple tools. 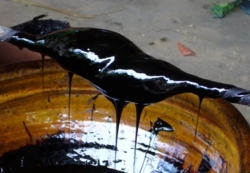 Lacquer is used primarily to protect and straighten bamboo and wooden items. It is also used as an adhesive to bind things. From early times lacquer has been used for these purposes. Among the ethnic peoples in Myanmar it still is. And it is also used to decorate and to ornament. Bagan in the Mandalay division and Kyaukkha in the Sagain division are well known lacquer centers. In addition, in the Shan States there are also several lacquerware producing centers. Kyaukka lacquerware uses simple black and red colors. It is mostly daily use and temple offering lacquerware. Bagan is Myanmar’s most important lacquerware production center. The makers are highly skilled craftspeople who use a variety of sophisticated techniques. The number of people involved in lacquer craft production has been declining in all areas except Bagan. Bagan survives as a production center due to tourism, which is large enough to sustain the industry, and importantly, to maintain a high level of skill and craftsmanship. In Japan, wood is the most common base material for lacquerware. 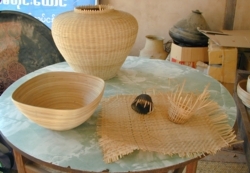 However, in Myanmar, bamboo is the main material. It is woven, coiled, and twisted to produce shapes. In addition, wood, cloth, horse hair, and metal are also used. In Myanmar there are many different kinds of decorative techniques. The main techniques are etching, drawing, layering and inlay. “Kanyit" is an etching technique. First the object is coated with acacia resin, then a pattern is etched on it. After that, the object is coated with colored lacquer. After the lacquer dries, the object is washed with water to remove the acacia resin and the unwanted color. The color stays only on the etched parts. Gold leaf layer technique (gilding) is called "Shwei zawa". Orpiment powder mixed with neem resin is drawn on the parts that are not to be gilded. A thin lacquer coating is then applied. Next, gold leaf is affixed to the piece. After drying, the piece is washed remove the powder and resin revealing the pattern. 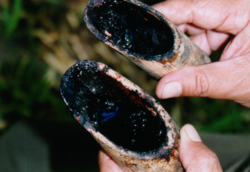 “Thayoe" technique is the mixing lacquer with bone or straw ash to make a putty to create a raised relief. Decoration designs on lacquerware are drawn using a number of motifs such as of animals and gods, folklore, royal palaces, mythological beasts and flowers, and Jataka (Buddhist tales). Urushi differs from European varnish, glue, or shellac. It is often confused with the shellac, which is made from the resin excreted by the lac insect (Laccifer lacca), which is also found in SE Asia. Natural lacquer, urushi, is made only from the purified sap of plants of the genus Toxicodendron, which grow in Southeast Asia, China, and Japan.